"How fast can you go?" is a question that we're often asked, to which we usually reply, "Not very!" But it's a question that interests most boaters. On a recent calm day with negligible current, we zig-zagged back and forth across Onondaga Lake and collected data on electrical current draw and the boat's speed. 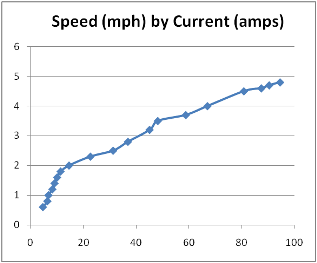 The horizontal (X) axis shows the amount of electrical current used in amps (48V). The vertical (Y) axis shows the boat's speed "across the lake bottom." When there are tides or currents, a boat's speed through the water can be quite different from its speed across the lake bottom. If the flow is powerful enough, a boat can be plowing through the water in one direction, but actually moving in the opposite direction. That's why we came DOWN the Mississippi River. SlowBoat is tied to the lock wall in Baldwinsville, NY, waiting for the lock to open so she can complete her trip. Here's a word from the Captain: How does Dragonfly, a homebrew hybrid electric vehicle, stack up against the competition? We've been eagerly watching for hybrid electric boats on this trip, and the pickings have been slim. Boating magazines are full of articles about "green" boats, sporting rooftop solar panels, auxiliary electric propulsion motors, etc., but they appear to be mostly: 1) as-yet unbuilt concept vessels, 2) small boats with limited ranges, or 3) fantastically expensive "green" yachts with gimmicks that don't begin to compensate for the enormous fuel-burning engines that drive the vessels most of the time. (Note: We have encountered a few noteworthy exceptions, such as Ted Moores's Sparks, built by Bear Mountain Boats. Commercially viable hybrid electric boats are on their way, but in the meantime, let's compare Dragonfly with a popular hybrid road vehicle, the Toyota Prius. Fuel consumption, engine only (mpg) 5-6 mpg N.A. Fuel, consumption, engine only (gph) 1 gph N.A. Every mile of Prius travel is powered, directly or indirectly, by fossil fuels. The energy for the vehicle's electric motor comes from the vehicle's gas engine. (Even the brake regen energy comes--indirectly--from the motive force of burning gasoline). In contrast, when Dragonfly is running on its electric motor, all of the energy used to move it is solar photovoltaic. (For our Great Loop trip, we had no other way of recharging the propulsion batteries). For full-time cruising boaters, a boat is not just their vehicle; it is also their home. For us in 2010-11, Dragonfly was not just a replacement for our Honda Fit; it was also, from an "ecological footprint" perspective, a replacement for our 4-bedroom house (which was rented to someone else, and consequently part of their ecological footprint). In later posts, we'll look some more at the issue of hybrid vehicles, including comparing our hybrid boat with a typical non-hybrid boat, and assessing the "cost" of hybridization in our boat and in two other Toyotas: the hybrid and non-hybrid versions of the Camry.